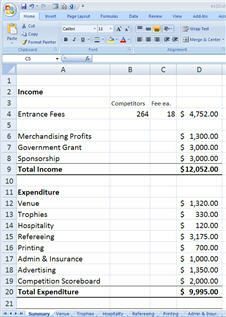 For this activity you will use Microsoft Excel, spreadsheet software, to construct an event budget. 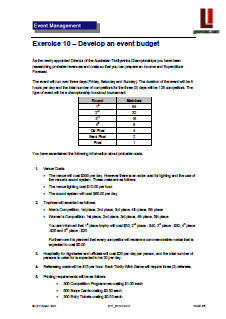 If you are ready to undertake this activity you should download the Activity Sheet (in MS Word). Click on the image below to download. A template in Microsoft Excel is provided for you to make the task quicker to complete. Click on the image below. You should take special notice of how workings have been set out for you in the template. The technique of using multiple worksheets in a Microsoft Excel "Workbook" is very important in developing complex budgets. Trying to put all calculations into one worksheet leads to numerous problems and has significant limitations in developing a more complex budget. Note: Don't crowd everything on to one sheet. It is particularly important and useful to utilise different worksheets for different sections of the budget.